In many ways, systems are constructed to resist change – so what do we do when those systems aren’t serving in equitable ways? What approaches are effective at making positive change happen – and quickly? 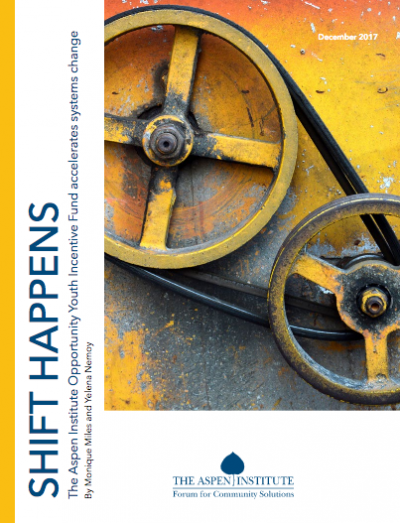 Today, our new report, Shift Happens: The Opportunity Youth Incentive Fund Accelerates Systems Change, looks at the ways in which opportunity youth collaboratives from around the country have been removing barriers and improving systems to serve young adults and help them succeed. 3) Implementing and sustaining collective action among stakeholders. The report highlights three OYIF communities that are implementing promising approaches to drive the systemic changes necessary to produce equitable education and employment outcomes for young people. In central Texas, for example, the Austin Opportunity Youth Collaborative (AOYC) has become rooted in the community while advancing systems change, where previously there was little structure to address these equity issues. Among the major initiatives there is a partnership between the Austin Opportunity Youth Collaborative and Austin Community College, with the goal of creating a system of wrap-around academic, social, and financial supports for youth and implementing policy changes at the community college to enable it to better serve opportunity youth. In Massachusetts, the Boston Opportunity Youth Collaborative has made tremendous strides by building on existing programs for a more integrated system that benefit all opportunity youth. A public-private collaboration among city leaders has resulted in a significant increase in college attendance and completion among the city’s public school students. In the Seattle/South King County area, the Road Map Project’s Opportunity Youth Advisory Group has been able to leverage significant resources – millions in private and public funding – while building active partnerships with a wide range of stakeholders. Among the Opportunity Youth Advisory Group’s achievements, is developing a regional system to reconnect opportunity youth to education and employment pathways. The experience of these communities shows that substantial changes to systems can happen when communities come together to plan, coordinate and act. Learn how these communities created the fertile ground needed to support systemic change, and what results came about.